I know it's sort of a bizarre thing to say, but I am on a major cabbage kick lately. I'm loving the crunchy texture in salads, on tacos, or even sautéed with pasta. Conveniently, one of my favorite prepared products at these grocery store is bagged slaw mix. Not the type that comes with any sort of dressing, just the chopped mixture of green cabbage, red cabbage, and shredded carrots. Whipping up a gourmet slaw couldn't be easier when you get to eliminate all of the cabbage prep work! This creamy, somewhat spicy, and super flavorful slaw is not only delicious, but also very healthy. The dressing is inspired by a recipe by Geoffrey Zakarian (my favorite star of the Kitchen) that I actually saw in Weight Watchers magazine. 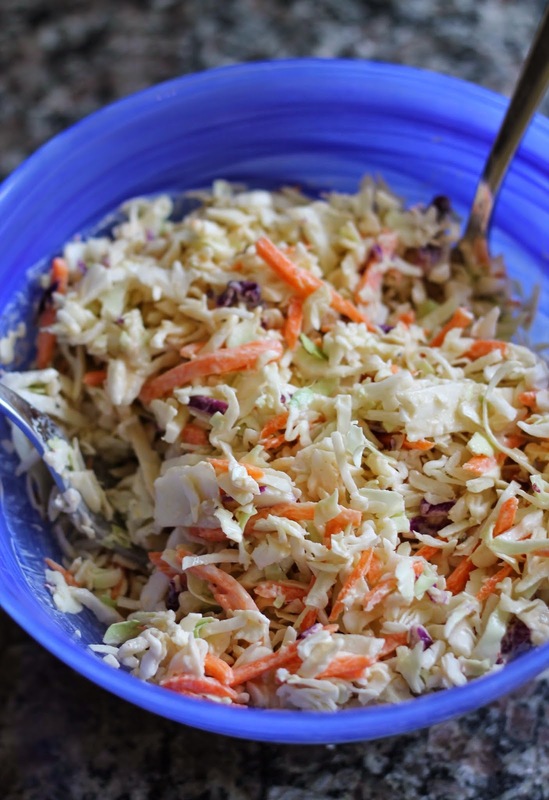 I enjoyed this slaw as a side, but it would be great as a topping for an asian-inspired pulled pork or beef taco. In a bowl, whisk together yogurt, peanut butter, rice vinegar, sriracha, sesame oil, and honey, until smooth. Add dressing to slaw mix and toss to combine. Garnish with cilantro and chopped scallions, if desired. Chill until ready to serve. Enjoy!